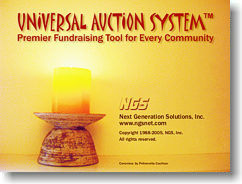 Make your next auction event a brilliant success with the Universal Auction System™. This software will save enormous amounts of staff and volunteer effort in planning and conducting an auction fundraiser. It is easy to install and use, and has many unique features such as online "Quickie Boards" not found in other auction systems.